I just started cooking in my kitchen again for the first time in 5 weeks, and I am so happy to be back at it. Only, the thing is, things are heating up around here! I mean the 70’s is hot for Seattle you guys!! And I know some of you guys are in sweltering parts of the country and seriously not wanting to turn on a stove or oven. This is for you. 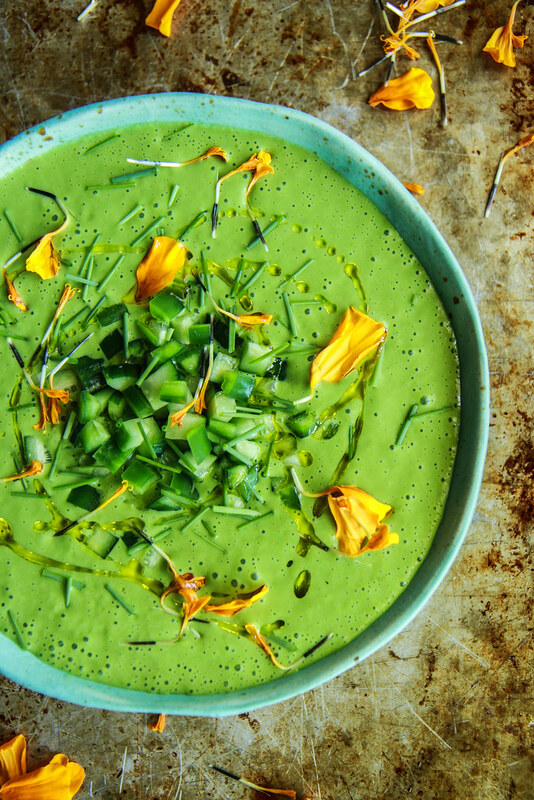 Green Goddess Gazpacho. 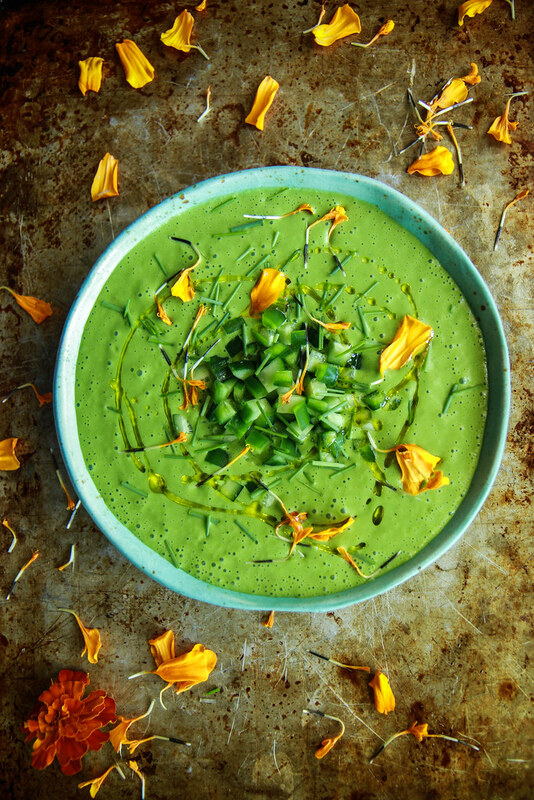 Gorgeous, savory, a tad spicy and a show stopping shade of bright green make it really special. Red Gazpacho is not really my thing- I always think it is just like drinking watery salsa- anyone else? 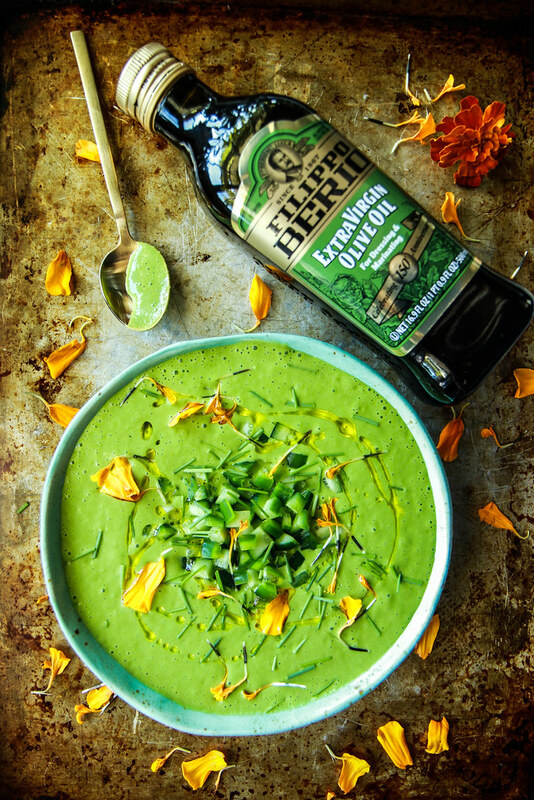 But Green Goddess Gazpacho made with Filippo Berio Olive oil is a whole different deal! It’s velvety texture is perfect served cold and I find it perfect for sipping or dunking toasted bread in. Preferably both. Also. DID I MENTION IT TAKES ONLY 10 MINUTES TO MAKE!!!! I was pouring myself bowls all weekend, and I find it’s great as a healthy snack, or works well as a basis for a plant-based meal. The rich olive-oil gives it substance and keeps me full for hours while I am also getting a hit of serious green vegetables. To commemorate Filippo Berio’s 150th year making Olive oil they are going on a Nation wide tour honoring their years of commitment to making the worlds best olive oil! Come sample Filippo Berio Olive Oil- they happen to be in Washington State and are hitting up Seattle this week! You can also enter their sweepstakes for a trip where you and a guest could win a culinary journey with an all-expenses paid trip to the Toscana Saporita Cooking School in picturesque Tuscany. Sign me up!!! Place the bread chunks in the jar of a blender and add the oil, water and vinegar. Let the bread sit for a few minutes, soaking up all of the liquid. While the bread is soaking, prepare the garlic, jalapenos and cucumbers. Add the vegetables to the blender and the spinach leaves. Blend the soup on low and then turn to high to make a very smooth soup. Season generously with kosher salt to taste. Chill the soup at least an hour, but preferably at least 4 hours. Serve the soup chilled with a few tablespoons of diced cucumber and a sprinkle of jalapeno plus a drizzle of olive oil. I like to serve with toasted baguette drizzled with olive oil. This post is brought to you by Filippo Berio Olive Oil. All content, ideas, and words are my own. Thank you for supporting the sponsors that allow me to create content like this for HeatherChristo.com! Is there an alternative to using bread? Maybe cauliflower rice? Thank you! That is a great idea Sarah! I think that would add great flavor and a little thickness. This looks absolutely stunning! Such a beautiful, refreshing Summer dish! Definitely sweltering here in New England right now. Hazy, hot and humid for days on end. Which means no oven for me! So I’m all about this beautiful gazpacho, especially with all these fresh toppings and that drizzle of olive oil! Such beautiful color! And 10 minutes to prepare? I’m in! I love the color! Going to make this soon! Just 10 minutes? Yes please! It’s only 70 there? Gah! I think you should send me this gazpacho to cool us off! 98 today yikes! Love the olive oil by the way! I thought of you Lindsay! I know how horribly hot it is there- I hope you guys are staying cool! You and your recipes are AWESOME and I will be sharing them with my Vegan Grand Daughter. She and her family will really enjoy the Saffron Strawberry Quinoa Salad!